I have edited the content into Word . Below is the CREATE_DIRECTORY package I have written which means that users do not need to be granted CREATE ANY DIRECTORY in future. Updates to the package will be made to this URL. The above code can act as a workround to allocating the CREATE ANY DIRECTORY privilege, in light of the vulnerability I first published on that allows any user with CREATE ANY DIRECTORY to overwrite the password file with a known password file containing an unauthorised SYSDBA account. So UKOUG so far has been interesting. Starting with Tom Kyte talking on Encryption, I picked up these points from it. -TDE was convenient for application integration (transparent). -Column level encryption in 11g was a bit of a pain as cardinality (fks) and indexes were inconvenienced. -From performance perspective BLOB data types very slow to encrypt therefore < 4000 use varchars for speed of encryption. -Tablespace encyrption is very nice as no query performance hit as SGA cleartext (and sentrigo will still work) but data files on their own do not represent a risk as encrypted. Then I enjoyed Slavik's Presentation on Oracle vulnerability discovery and Sentrigo Hedgehog. The new fuzzer looks great and will be available via Slavik’s blog quite soon. I also enjoyed Michael Moller‘s presentation on Internationalisation. Looking forward to Pete’s presentation on Friday. All in all good conference and great to meet Tom, Jonathan and Julian there. 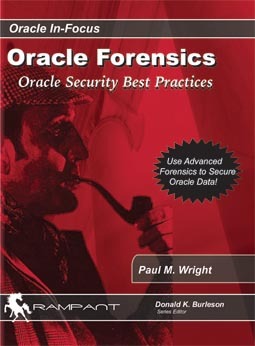 Already started writing my presentation for the next year which is entitled “Three Tier Oracle Forensics”. It is to do with the problems of logging and responding to web activity through to the DB. There are challenges with Time synchronisation and identifying the web session at the DB end, though these are beginning to be solved to the point at which legalised formalities can be standardised upon.